Redco™ Mirrored Sheet has the industries toughest protective back-coating, which protects against scratching during fabrication. This durable acrylic mirror is ideal for all type of projects including areas where safety or vandalism are concerns, point-of-purchase displays, casinos, children’s toys, cosmetic displays and for applications in the food service industry. Redco™ Mirrored Sheet is half the weight of glass and 43% the weight of aluminum, while being eight times stronger. It is weather and fade resistant and can be drilled, sawed and cemented. Service station facilities, point-of-purchase displays, dance studios, interior decorating, casinos, children’s toys, cosmetic displays and for applications in the food service industry. 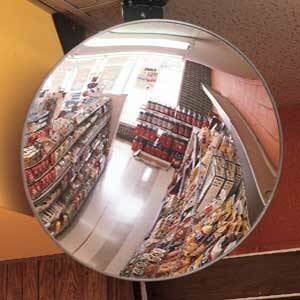 Redco™ Convex Mirrors prevents accidental collisions by allowing the viewer to see around corners, in large warehouses or small hallways, as well as increasing a viewers area of sight enabling the surveillance of a larger area thereby discouraging theft and vandalism.